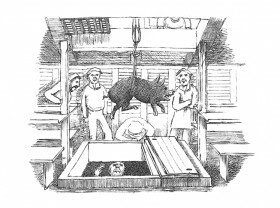 Pig being lowered on a winch. The ships that sailed to South Australia in 1836 carried livestock to provide fresh food for passengers in cabin class. Animals included cows, sheep, hogs, sucking pigs, fowls, turkeys, ducks, geese, goats, rabbits and horses. They supplied eggs, milk and meat. Some animals were saved for stocking the new colony. 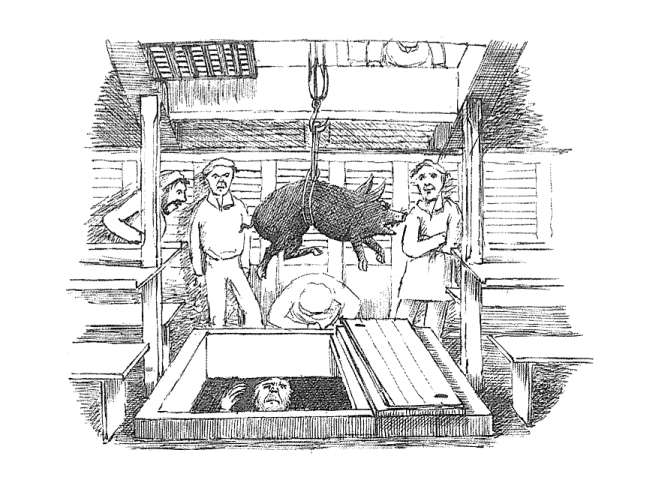 Animal stalls were built between decks, pens and hen coops above, and on all ships passengers and animals had to endure cramped and smelly conditions. On one ship the decks were scraped and sluiced with sea water daily in an unsuccessful attempt to rid the passengers’ living quarters of the ‘evil smells’ that emanated from the animals’ stalls. Men were assigned to care for and slaughter the animals. During storms, ships rolled and tossed animals about, occasionally even overboard. Small animals drowned in pens swamped by swollen seas. Feed and water troughs cut sheep’s legs, and had to be removed from pens. The person caring for the livestock on the John Pirie ‘moved all the Sheep into the weather Pen, and filled it half full of Hay, where they have a little more comfort, than in the lee One, and are not in so much danger of being drowned’ at one point during a severe storm. Ships also had makeshift ‘hospitals’ for animals – often just a small space between decks where they could recover. Despite their keepers’ best endeavours, many animals died from sickness or injuries caused by storms. Charles Simeon Hare looked after the animals on board the Emma. In one ‘perfect hurricane’ he lost two cows, a mare, a stallion, seven sheep, five goats and all his poultry. And all despite the fact that he and four other men tended the animals around the clock. During the storm Hare had to sling the horses, using the hides of the dead cows and bales of hay to relieve their chafing. The animals that survived were a sore, bruised and sorry bunch. Such were the difficulties of keeping livestock on board ships in the 1830s.